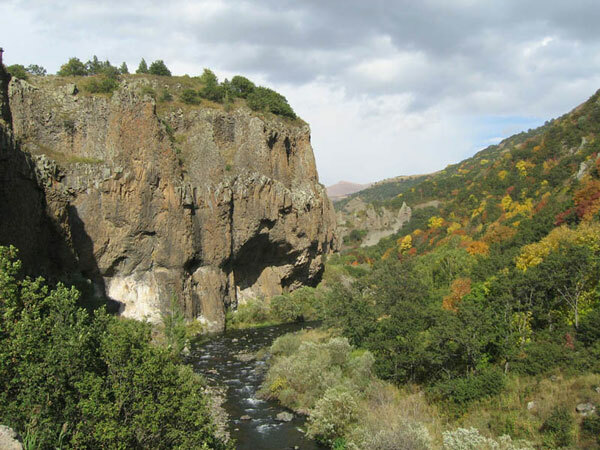 Khosrov Forest reserve was established in the 3rd c CE by the Arshakuni King Khosrov the Great, grandfather to Trdat III. 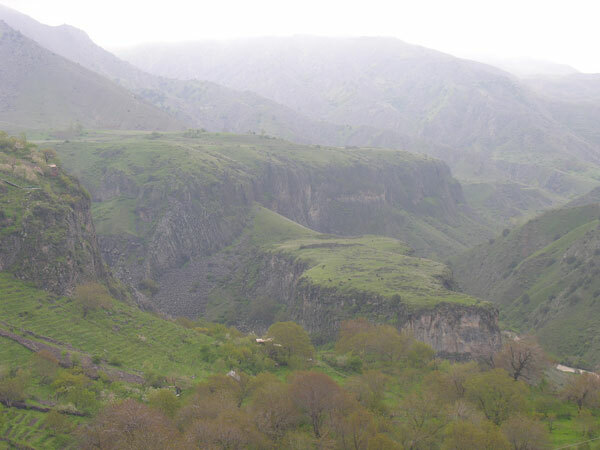 Khosrov is reputed to have had planted over one million trees, creating a private hunting preserve while saving a piece of Armenias unique ecosystem for generations. Most of the forests from his time are gone, clear-cut by Mongols, Safavid Persians and modern Armenians on illegal logging expeditions. The preserve is still important and quite large, consisting of 29,196 hectares, 9000 of which have trees, mostly scrub and cedar. The national park protects more than 1800 species of plants, 156 of which are considered rare, endangered or on the verge of extinction, listed in the Red Book. Fauna include rare insects, amphibians, snakes, the Armenian mouflon (Ovis orientalis gmelinii), Caucasian Bearded Goat (Capra aegagrus) and the Caucasian or Persian Spotted Leopard. The Caucasian Bearded Goat (also called the Bezoar or Persian Ibex, or the wild goat by scientists who believe it is the ancestor of the domestic goat) is an endangered species that has almost been hunted to extinction in Armenia. Male bearded goats are marked by large, scimitar-shaped horns, their front edges in a sharp keel with a series of bold, sharp-edged, widely separated knobs above. Females are smaller than males and have short, slender horns, but no beard. The goat favors rugged country at all levels, descending into the lower valleys in the winter and upper regions in the summertime. The bearded goat is listed in the Red Book and in the IUCN list of Endangered Species. The Caucasian or Persian leopard is said to be the largest of all subspecies of leopards. It can grow to up to 1.5 to 2.7 feet tall and weigh as much as 155 lbs. Before 1990, when Armenia, Azerbaijan, Georgia, Russia, and Turkmenistan were the Soviet republics, the scientific names of the leopard used in these countries were P.p. tulliana and P.p. ciscaucasica, whereas the name P.p. saxicolor had been traditionally used by the western specialists for the cats in Iran and, partially, Afghanistan. Most Leopards are light tan or fawn with black spots, but their coats are very variable. The spots tend to be smaller on the head, larger and have pale centers on the body. The name Leopard is a combination of leo (Latin for lion) and pard («panther»), the animal believed to be a hybrid of lions and panthers. Interestingly, the panther is simply a darker version of the spotted leopard, they are very much related. The leopards are remarkable felines, able to hunt in trees as well as on the ground, feeding on everything from insects and rodents to fish and large game. Excellent tree climbers, leopards often protect their larger kills by carrying them up a tree. In Armenia, the Persian leopards live in the juniper sparse forests and, to a lesser extent, in arid and mountain grasslands, subalpine and alpine meadows. Their haunts are extremely rough terrain; rock outcroppings and cliff sides. The leopard uses the same trails during regular movements, enabling researchers to find and study the reclusive animals. Unfortunately this also enables poachers to hunt the animals (see side column). The leopard in Armenia is threatened by disturbance, poaching and wild fire, but perhaps mostly by the wholesale slaughter of their main food, the mouflon and bearded goat, both almost poached out of existence in their main hunting grounds. Flora in the preserve is as rich and varied as its stunning terrain, with over 1800 plant species (more than half of Armenias total), 156 of which are considered rare, endangered or verging on extinction. A number of species listed in the Red Book grow only here. Khosrov Preserve is the only Caucasian natural preserve of mountain xerophytes, terrain combining semi-deserts, phryganoid formations, arid thin forests and tragacanthys steppes. The preserve is under ecological attack by international and local huntsmen and an ambivalent to cynical government that instead of protecting endangered species or those at risk instead actively hunts or sponsors hunts into the officially protected area. Reports of military officers organizing helicopter hunting trips into the preserve, where protected species are hunted down with automatic weapons are common. While gatekeepers stop eco-tourists from entering the area, generals, ministers and wealthy international hunters use the park as their private hunting grounds, further endangering the species that attempt to survive in the park.